Ashley Bates Island residents continue to struggle to get definitive answers about safety. The health issues of Vicki and Trelease Miller-Jones and their two daughters are typical ones on Treasure Island. Vicki had mild asthma as a child that she said she "grew out of," but then it "came back to life" when she moved to Treasure Island in 2007. It's hard for her to breathe at times, especially at night. Every evening, she uses a nebulizer — a breathing device that she's never needed before. On Vicki's back is a leathery, three-inch diameter rash that won't go away. Vicki's partner, Trelease, has painfully raw and dry feet — a problem that is shared by at least ten neighbors, particularly those who wear sandals. Vicki and Trelease's two daughters, seven-year-old Brianna and nine-year-old Taylor, have been sent home from school with stomach troubles. Brianna has itchy rashes on her back, arms, and legs, as well as dry, bald spots in her scalp where her braids have literally fallen out. Many of the neighbors' children have the same rashes and bald spots. The Miller-Jones family used to live in Oakland, near Lake Merritt, and they are contemplating moving back, but their community is on Treasure Island. "There's a part of me that hates that we moved here," Vicki said. "I feel like our lives were better in Oakland. Our health was better — that's for sure." Trelease said, "It's beautiful here, but it's deadly"; she added that she would "rather be dodging bullets in Oakland." According to residents, health problems abound on Treasure Island. Nonetheless, officials from the Navy and the City of San Francisco continue to assure residents that they're safe. Health officials have conducted radiation surface scans and have told Treasure Island's 2,000 residents that all dangerous areas are fenced off. Residents, they say, have nothing to worry about so long as they observe the prohibition against digging on the island. These assurances follow an Express investigative story in early September that revealed reports of high cancer rates among past Treasure Island residents and insider accounts of very dangerous radioactive material having been handled unsafely by the Navy and its contractors (see "Treasure Island: A Radioactive Isle," 9/5). 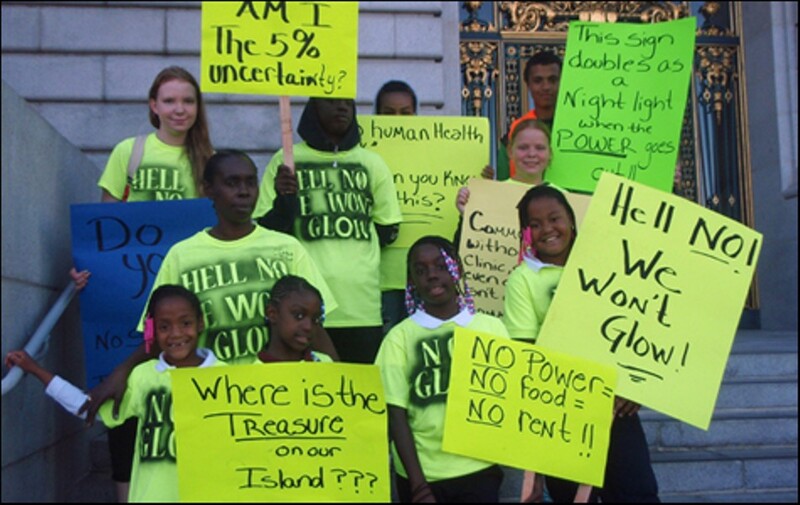 The assurances from public officials also belie the reality on Treasure Island in which potential risks are plentiful, residents feel compelled to initiate their own grassroots health studies, and the city and island businesses have incentives not to make investments in shoddy infrastructure that could present additional public health hazards. On September 11, radiation expert Robert Burns was summoned by the Treasure Island Development Authority to mollify the San Francisco Board of Supervisors' concerns. "If you're talking likelihood of a public health risk, I would say probably less than 5 percent," Burns said to audible gasps from Treasure Island residents attending the meeting. He was presumably referring only to radiation-related cancer risks in inhabited areas of the island, not to risks in fenced off, highly radioactive areas where past residents lived. (Many of these past residents attribute their cancers to radiation exposure.) Moreover, as a radiation expert, Burns could not speak to the added risks posed by at least 24 non-radioactive contaminants of concern in the air, soil, and groundwater. These include asbestos, lead, PCB, arsenic, and dioxin. Burns' probability estimate might have been higher if he had accounted for both radioactive and non-radioactive chemicals. Officials have similarly tried to play down the possibility that the public was harmed as a result of botched cleanup practices. Amy Brownell, an environmental engineer with the San Francisco Department of Public Health, said at an October 15 hearing at San Francisco City Hall that Shaw Environmental, a Navy contractor that conducts most of the remediation on the island, had received only one notice of violation from the California Department of Public Health (CDPH). In truth, the "one" violation that Shaw received referenced prior violations and detailed a litany of serious, distinct, and repeated radiation safety violations over at least a three year period. CDPH was unable to directly monitor Shaw's work before 2010 — when the most dangerous radioactive cleanup work was happening — but a CDPH spokesperson confirmed by email that CDPH found evidence of violations in Shaw records dating back to 2009. The text of a June 2011 email from CDPH that accompanied Shaw's "one" violation reads: "CDPH found numerous instances where Shaw failed to conduct and/or document radiation/contamination surveys. ... 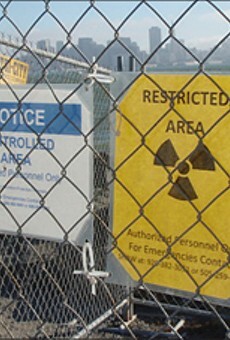 It is apparent from these and previous violations that there is a lack of radiological oversight, practical hands-on experience with environmental radiological projects and methods, basic radiation technology experience, and/or a failure to include the Radiation Safety Officer in production management decisions that affect the radiological protection program at the Treasure Island project." The email further noted that Shaw's failure to properly calibrate and conduct performance tests on survey meters was "so serious that [Shaw] must correct it immediately." Residents who know that radiation is not the only concern on an island full of dilapidated infrastructure and former Cold War-era laboratories have requested more information on the potential health effects of non-radioactive chemical contaminants. However, the issue has not been on the agendas at recent public meetings and hearings. At the same time, the oversight process on Treasure Island is muddled and reflects the interim state of affairs as the Navy prepares to transfer the island's buildings to the City of San Francisco. Many of these buildings will ultimately be torn down if a multimillion-dollar development project goes forward as planned. The Navy and its contractors are responsible for the initial remediation projects. Once the Navy's remediation is certified by either the California Department of Toxic Substances Control (DTSC) or CDPH, the building can be leased to the Treasure Island Development Authority, which currently is subleasing to almost one hundred commercial businesses. This cash-strapped city agency requires businesses to accept the buildings "as is," which creates incentives for the businesses not to clean up lingering contamination. The Treasure Island Development Authority pays the San Francisco Public Utilities Commission about $5 million per year to maintain electricity, water, natural gas, and waste management systems on the island. It does not assume responsibility for capital investments in substandard pipes and sewer systems — or for the potential health risks associated with them. The same is true of the electric system; island residents have suffered at least 35 power outages in the past ten months. Many residents are especially concerned about the water, which is tested at other sources but is not currently tested as it comes out of residents' faucets. Resident LaShawndra Breston saved a jar with a sample of brown water that came out of her sink faucet while she was washing spinach last month. Resident Seanda Conley's bathtub faucet emitted reddish-brown water less than two years ago; she also has pictures of green water that came out of the same faucet this month. Last weekend, after a water-main break on the island, emergency notices were distributed to residents warning that "consuming regular tap water at this time may cause stomach, intestinal, or other illness." Residents were told to boil their water and were provided with portable toilets. It's impossible to know without a scientific study if the health problems on the island are connected to contamination. Even if there is a correlation, causation may be difficult to prove. Some residents, including formerly addicted and homeless individuals, came to Treasure Island with already compromised immune systems and may be predisposed to certain illnesses. Moreover, a large number of people are needed to definitively establish a disease cluster — something that's been a challenge even in famous environmental cases such as Erin Brockovich's successful fight against PG&E. Given all the uncertainty, residents have felt compelled to conduct their own research. They recently formed the Treasure Island Health Network, which is being advised by environmental health experts in the Bay Area. The network has a website (TIHN2012.org) and is about to launch an online petition on Change.org calling for health officials to open a clinic on the island and to conduct a scientific study of health issues among past and present residents. The network has also begun distributing an anonymous survey that seeks to identify illness trends. Meanwhile, past residents from the 1970s are tracking down their high school classmates to determine exactly what percentage have developed cancer — a challenging task that may take months or years. At a September 28 meeting of the Treasure Island Health Network, eight of fifteen attendees reported that they suffered from dry, blotchy rashes (which may be caused by shower water), and twelve of fifteen suffered from asthma and other breathing problems. Gastrointestinal issues also seem common, and at least three residents in adjacent apartment complexes recently had gall bladder removal surgeries. Dozens of residents interviewed by the Express indicate that they never had rashes or serious breathing troubles before moving to Treasure Island. Residents also continue to struggle to get definitive answers about their families' short- and long-term safety. 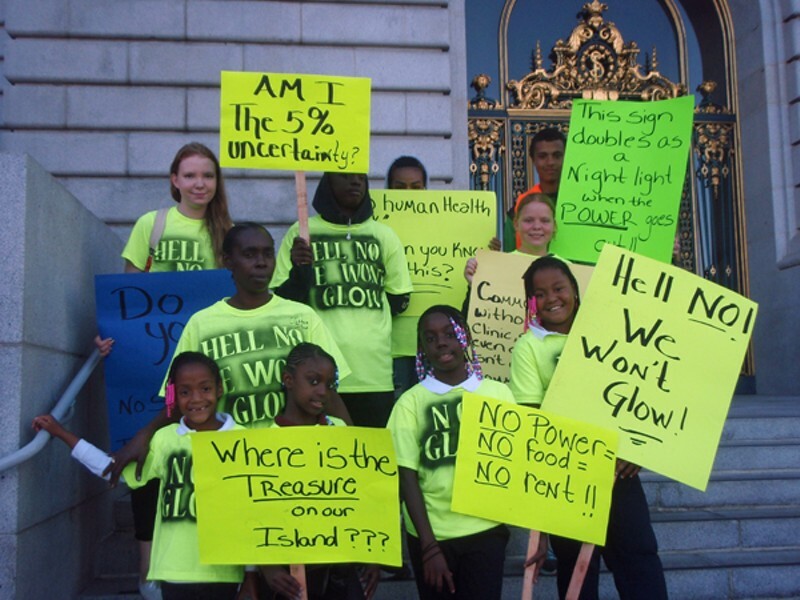 On October 15, residents staged a demonstration outside San Francisco City Hall shortly before a hearing to discuss only radiation-related hazards (not hazards posed by non-radioactive chemicals). More than a dozen demonstrators wore hand-stenciled neon yellow shirts with slogans like "No Glow" and "Contamination Destination." Drivers passing by honked their horns in support as island children chanted, "Heck no! We won't glow!" and waved signs saying, "Give us a clinic and a disease registry," and "Am I the 5% uncertainty?" A sign carried by ten-year-old Izjhanae Singleton asked, "Where is the treasure on our island?"